When using Paste From Word option, anchor tags (<a name=...>) are stripped from the code. I have set PasteFromWordRemoveFontStyles="false" and PasteFromWordRemoveStyles="false". The only way to retain these tags is to skip cleanup using PasteFromWordPromptCleanup="true" and choose no at the prompt. Sample Anchor Document.docx​ (12.5 KB) - added by Jake Berkes 7 years ago. 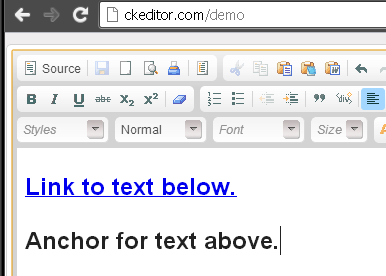 I have tried your sample file on demo page and in latest CKEditor 3.6.4 and anchor was never removed. Please use latest version of CKEditor and if you have done any customizations please check if they are not causing this error. I'm closing this issue as invalid. If you think otherwise please provide detailed TC explaining step by step what to do to get this error (Perhaps configuration setting also matter). Using the attached "Sample Anchor Document.docx" file, select all and copy. Using http://ckeditor.com/demo page, paste the text using Paste From Word. The problem is immediately evident visibly - the line "Anchor for text above." should be preceded by an anchor tag; it is not. if an <a> tag is pasted with a name and no href, it deletes the name. Is this behavior intentional? If so, can you supply the reasoning behind this? In source version of this file \ckeditor\_source\plugins\pastefromword\filter\default.js There is a comment saying that anchors with content are dropped due to #3582. This issue is now fixed thus pasteFromWord filter should also allow for anchors with text. I think that current way how filter works is invalid. Filter should not remove anchors with but instead let them go through and if user decides to remove (putting text in anchor is probably not very popular) or edit text of such anchor he should have this possibility through anchor dialog (#9406). that way you will be able to paste such tags. If you get any errors after this change it would be nice if you could report them here. I have applied the workaround as recommended and can confirm that it does work properly. I apologize if this is an unnecessary comment but I wanted to provide confirmation in case it might help others. Can a fix for this be incorporated into an official release? 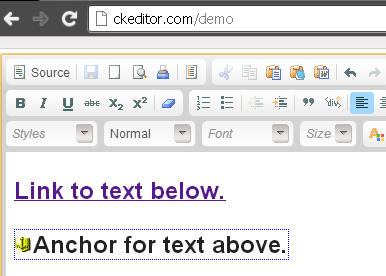 Anchors are still getting removed from content pasted from Word in CKEditor 4.x builds. It looks like the code that is filtering these anchors is a bit outdated. It's there because of #3582, which is not any more an issue. This needs to be reviewed and we should be able to have anchors working at that point. Pushed ​t/9330 on dev and tests. No fix for link's to anchor absolute path on IE. Branch t/9330 on tests shares one commit with #8103 ticket (t/8103) which is on review too. as explained by @Reinmar this will be gone when official Opera on Blink engine will be released. Fixed on master with ​git:bde01c9 and f029dec on tests.